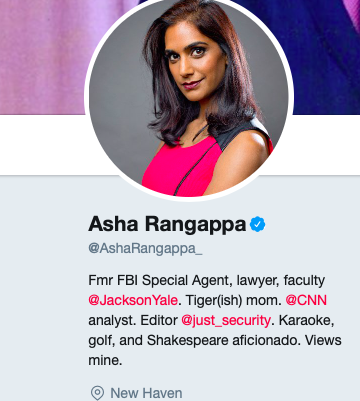 Rangappa never finished her 1st assignment at the FBI (she left after 2 years) and has made a career of falsely representing herself as an authority on these issues. A total fraudster who goes on CNN & pretends she has credentials that aren't there. "Fmr FBI Special Agent" leads her profile. She's 44 years old. Was in FBI in her 20s. Served in Bureau after 9/11. Has been an academic for last 15 years. Total charlatan. "Dont forget her finest academic achievement," anon tipster reminds me. 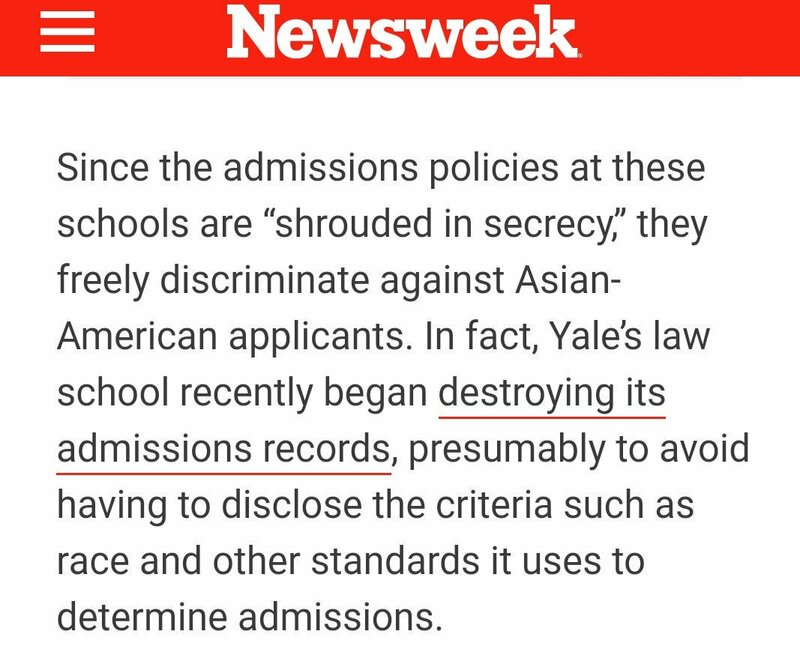 It appears Rangappa played a major role in covering up Yale's racial discrimination controversy. John Brennan was declared "on leave" in June, 2016. 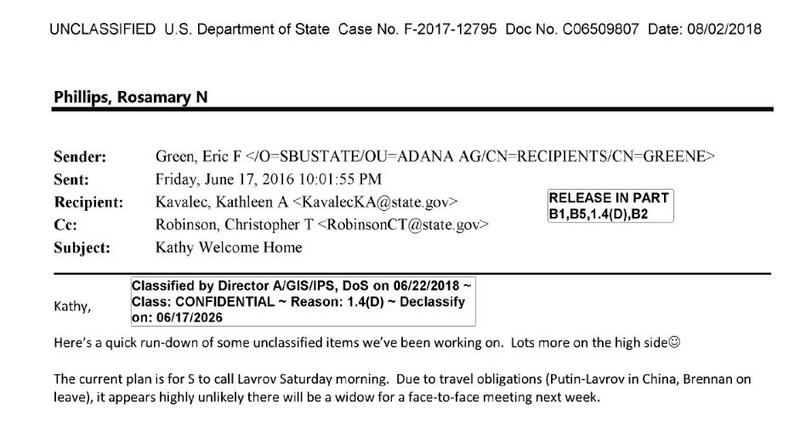 Sender is Eric Green, who was at the time the director of Office of Russian Affairs in the State Department. Today, he serves as deputy chief of mission in Poland. Only 5 days earlier, the horrific nightclub shooting happened in Orlando. Quite strange that they would put Brennan on leave after what was the worst ISIS terror attack in US history. My reporting is very specific: You sit on the board of a front org that is fully controlled by the Qatari gov't and they continue to trot you out as a spokesperson for the group. That is something you cannot deny. I never said you work directly for Qatar. Update: CNN has removed Kayyem's ICSS (the Qatar front group) board position from her bio. It was still there as of a couple of hours ago. I have reached out to CNN for comment. In describing the claim as a false allegation, CNN confirmed to me that Kayyem was under contract with the Qatar-controlled institution, but says she is no longer there. I didn't know she was being paid... Kayyem's bio has for many years stated her affiliation with ICSS. Details: The Qatar lobbyists met with Baquet in New York City on 7/26/18 for a "General discussion on Qatar" & a lawsuit involving fmr RNC official Elliot Broidy, who has been a target of Qatar for some time. The next day, the lobbyists met in person w/ WaPo's Marty Baron in D.C.
As low profile FL Mayor, Andrew Gillum spoke at a 16' Qatar conference in Doha. Never discussed it publicly. All $$$ paid for, likely by Rick Smotkin, who recently registered as a Qatari lobbyist. Smotkin later donated max $ amount to Gillum campaign for Gov. Very, very sketchy. The issue here is Gillum using a representative of a foreign state as his apparent travel agent. And in addition to letting Qatar pay for his expenses, the lobbyist, who is paid by Qatar, gives max $ to his campaign. This is how the seeds of foreign bribery scandals are planted. 2. This is why assimilation in the United States is SO SO important. The Somali refugee community in MN is very much insulated from outside perspectives. This has led to a tremendous ISIS indoctrination and extremism problem, among other things. Qatar, which funds terror orgs, is spending millions of $$$ hiring US lobbyists to help clear the legal & political hurdles necessary to build spy planes (yes, military UAVs) in South Carolina. Have a lot of docs to show exactly what is happening. Is this a story u would read? Thanks for the feedback. I've been working on this for some time. Story out very soon. John Brennan played an integral role in destroying the integrity of our most important national security institutions. He used the IC to spy on & advance a hoax investigation against POTUS. His actions are absolutely indefensible & radically un-American. To many of us, it's quite shocking (and baffling from a comms perspective) to see Amb. Haley promoting an appearance with the man who did so much damage to our nat sec institutions. Brennan engaged in extraconstitutional action against the very POTUS she served under. Bizarre. Brennan has accused POTUS of committing *treason*. He's on neverending mission to destroy him. Haley knows this yet she still promotes Brennan like he's just another former CIA boss. No, Brennan broke w/ the norms. He continues all-out war on the president's duly-elected mandate. Incredible whitewashing from AP on Ilhan Omar's anti-Semitism, titled "Omar's edgy Israel tweet no surprise to some back home." They interview "Isaiah Breen of Minneapolis," who plays GOP Soros card. Never mentioned: Breen was Keith Ellison's PressSec! 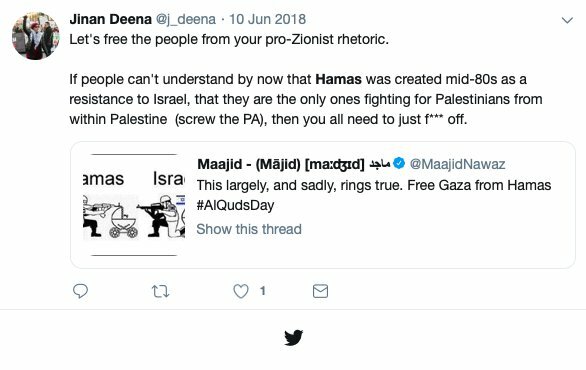 Worse, Breen and his colleagues that is also interviewed in the piece work for what the AP describes as a "local Jewish nonprofit," which is affiliated with Bend The Arc: Jewish Action, a Soros-funded outfit. This piece is junk journalism. 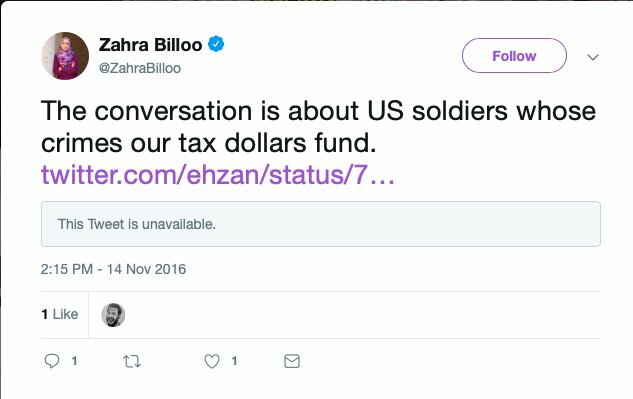 AP also interviews a CAIR leader, who has massive conflict of interest given that CAIR directed huge funds to her political campaign. The New York Times, BuzzFeed, The Daily Beast, Vice, and countless others fell for the latest Trump-Russia hoax. Will they issue retractions/corrections? Don't hold your breath. She was apparently detained by the FBI as a “material witness” to a criminal case. Yesterday, someone nuked her Wikipedia page, which spelled out her extremist views. @CAIRNational? Columbia Journalism Review: "caught making stuff up in a 2002 Salon article, self-admittedly 'getting it completely wrong' ... & had his own memoir cancelled because of concerns over accuracy." 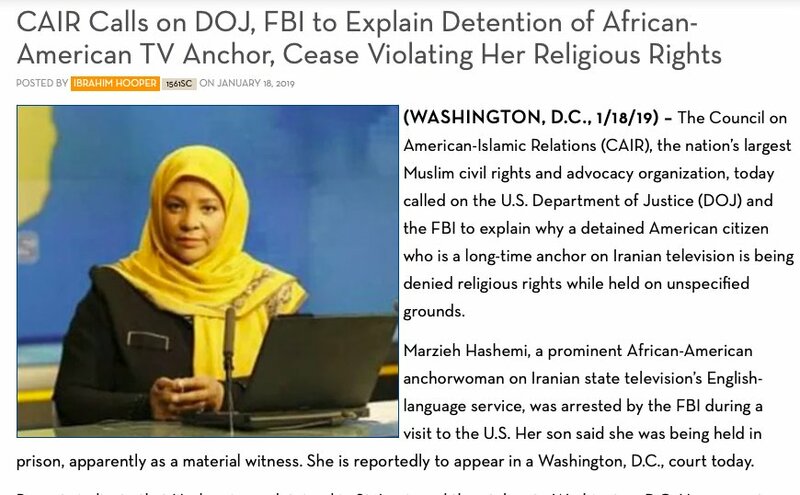 Jinan is a senior official @ CAIR. Last wk at a CAIR event, she introduced Reps Rashida Tlaib, Ilhan Omar, & Andre Carson in celebrating their elections. Check out this tweet I just found from June, 2018. She explicitly endorses US-designated terrorist group Hamas. Total delusion here. Stephens becomes unhinged and places himself in a dystopian state in which Moscow is a superpower. Putin's Russia might be an authoritarian state, but it is not close to the powerful force for Communism that was presented by the USSR. Also, quite odd that he is picking a big fight with Amb. Grenell, who has done so much good work in encouraging our European allies to push back more against Moscow. Stephens should direct his fire at our Euro allies like France and Germany, which continue to cozy up to Putin. China spends 3-4x more than Russia on annual defense. They are the main threat. Russia is a struggling state with stagnant economy, declining population, poor infrastructure, etc. Hardly an up and coming global rival. China is the big threat into the future. 1) She seems to be a genuine person & I respect her service. 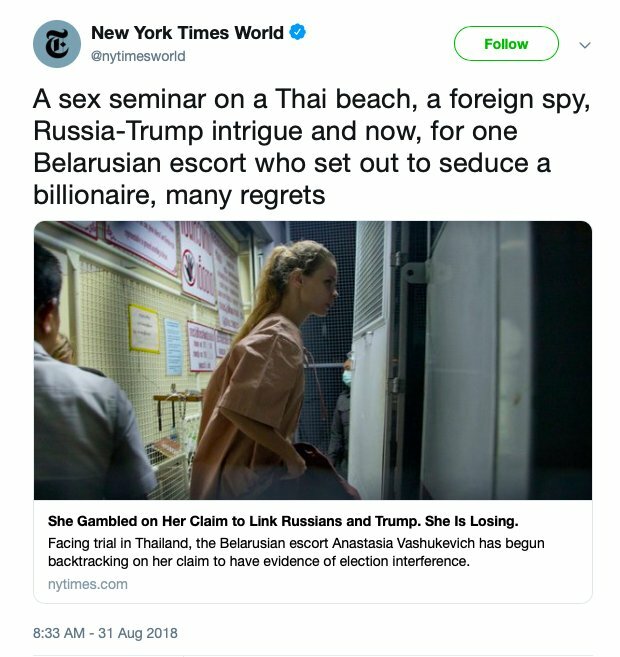 I have no reason to believe that she is acting as a foreign agent, and there is no proof for such an allegation. She has served her country honorably and remains a patriotic person. So I assume she plays an ignorant, unwitting role in spreading Russian and Iranian propaganda. This isn't to say that all of her instincts are bad. She is certainly right in her critiques of hyper interventionist policies that led to the long wars in Afghanistan and Iraq. Congress needs more voices for general restraint in foreign policy. Privately "crowdsourcing the wall" is not a serious policy idea. You will never get enough sustained private funding to build the wall in addition to bolstering border security as a whole. It's a pipe dream. We need real solutions, not feel good ones. Folks, I am a small government person. Our government's #1 priority is to protect our rights. They do this by investing in our national defense. Border security is NOT a private sector issue. It is one of the chief responsibilities of the federal government! 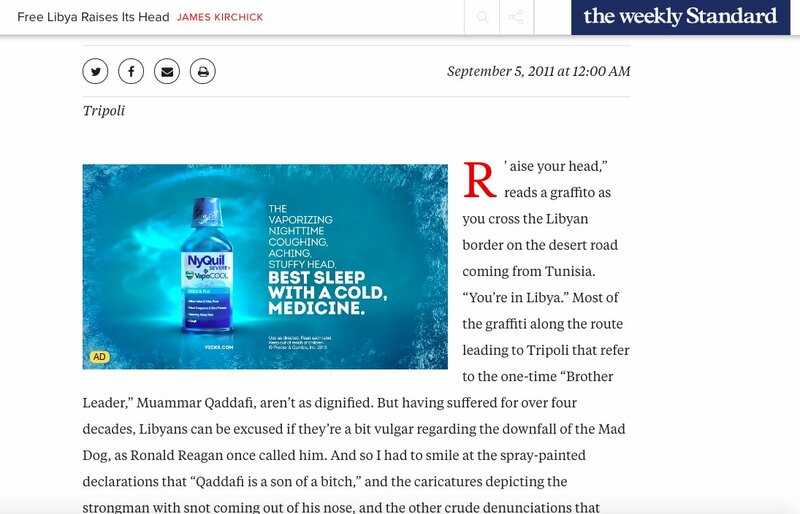 HuffPo also once launched an Arabic site (HuffPostArabi). Quickly turned into a stream of Ikhwan propaganda. They later shut it down after countless pieces promoting radicalism. Looks like WaPo's Khashoggi crusade will inevitably end up going that route. -He was never a journalist. -Lifelong hardened Islamist who supported Al Qaeda & wished Israel would "die by force" via Hamas. Clarification: Khashoggi was a "journalist" years ago but for state-run entities that did not allow him to write freely. During this time, he simultaneously worked as an intelligence operative for KSA, before he fell out of favor with the monarchy. "our troops are engaged in terrorism"
Libya war planners, both D & R, have 1 thing in common: they haven't talked about Libya in YEARS. Can't blame em. The war resulted in a failed state rife w/ terror+slavery. Yes, slavery. 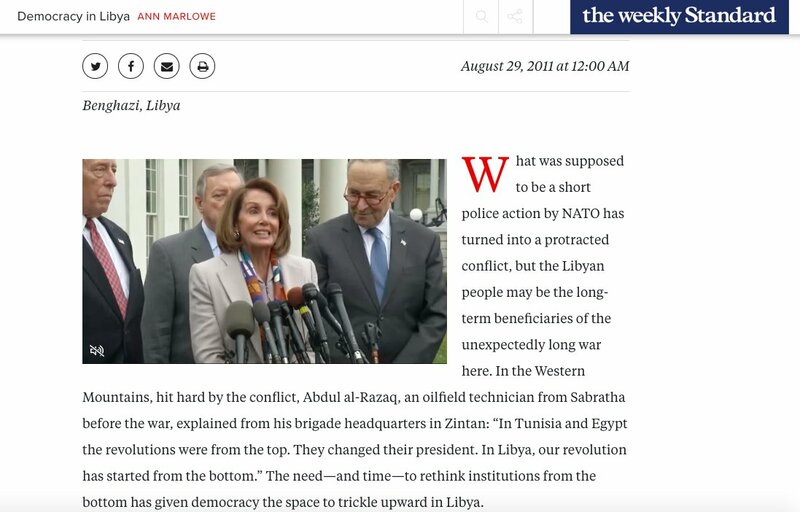 H/T to @davereaboi, who asked what happened to Libya War advocates. 1. 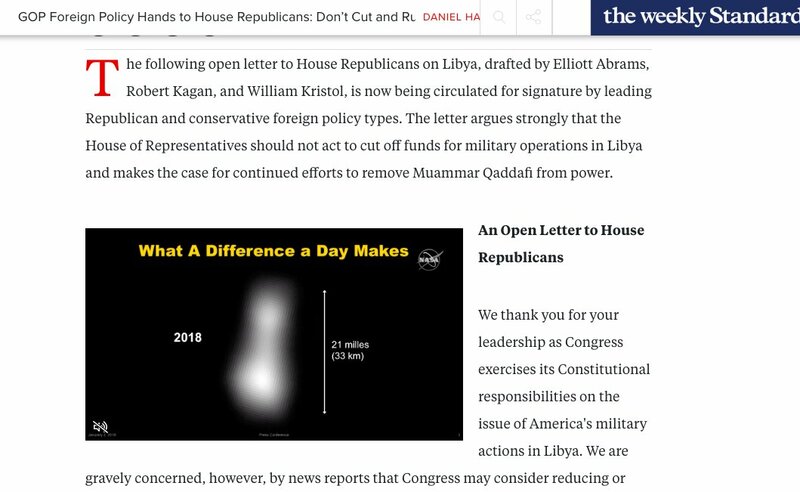 "GOP foreign policy hands" aka Bill Kristol and the gang: "Don’t Cut and Run in Libya"
2. 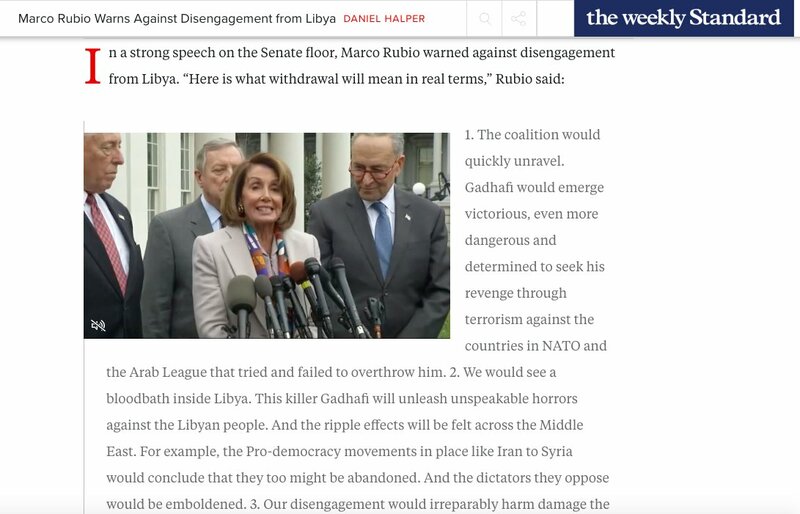 "Marco Rubio Warns Against Disengagement from Libya"
Besides this being a total smear job, it's inaccurate too. Khashoggi was a dedicated Islamist until the end. 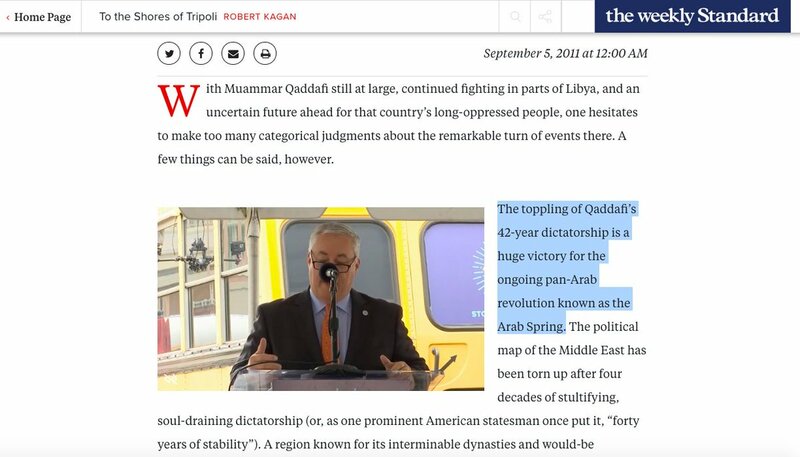 He defended AQ founder Azzam in September 2018!. He called for Hamas to exterminate Israel & its people in 2014! "Collapsed crying" for OBL in 11'! Amazing that this dude thinks defending MBS and accurately labeling Khashoggi an Islamist is worthy of an "Islamophobe" label. Moss strikes once again with a preposterous, dense, and lazy smear job. If anything, it's Moss who is the true Islamophobe.